LucaVagniluca, 43 years old, anthropologist and documentarist. Since 1988 he has travelled extensively through Africa and Asia, producing documentaries ,photographic and travel articles . In 1996 he participated in a 9 month research project on Shamanism in the Himalayan area of Nepal. In 1998 together with his wife he founded 91PARALLELO, an association specialised in documentaries and research. Sociable and determined, loves ,keeping moving, mountains and the simple things in life. Hates ..not keeping moving the seaside and the complicated things in life. Lusira, 4 years old ,started her life in Angola in the warmth of her mothers womb . 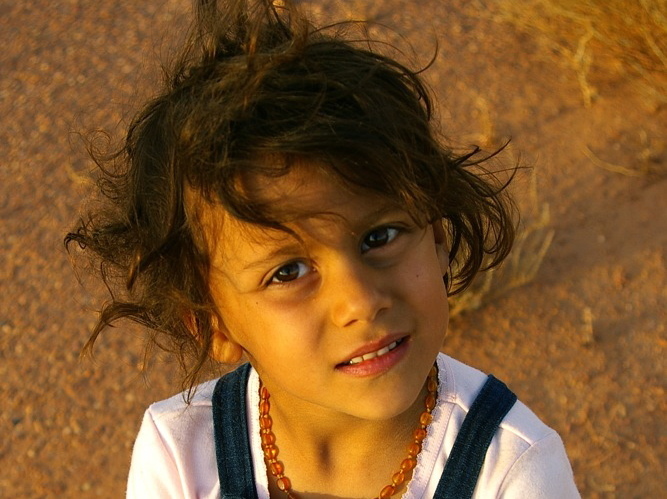 Experienced little traveller, participant on 2 long trips in 2008 and 2009 through Tunisia, Algeria, and Libia. Sociable, sensitive and curious , expert dune climber,loves more than anything her teddy, camels, drawing, picking flowers, and her friend Carlo. Sameena Hassan, 43 years old, archeologist and documentarist . Born in England from German mother and Pakistani father. After her studies at Manchester University, she moved to Italy in 1992 where she met her husband Luca. 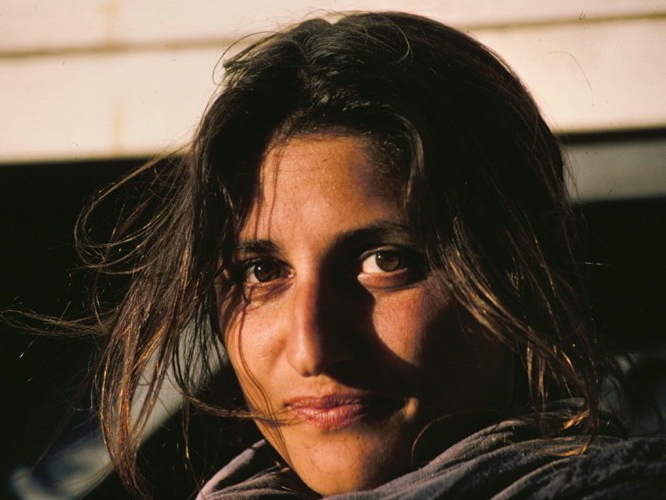 A founding member of 91 PARALLELO, she has been occupied mostly with the filming and editing of the documentaries produced. Loves, open fires,coffee in bed and (repetitive, but true) the simple life …Hates telephones, beurocracy and dealing with money. Ciao Luca, grazie per il vostro tempo passato a Dous. Non abbiamo avuto problemi a rientrare in Italia con il nostro Hymer S800. 64047 Montorio al Vomano (TE), domani lo incontrerò ma abbiamo contattato anche il sig. DIEGO BIANCIOTTO della http://www.bianciottosnc.it di Pinerolo (ha una marea di mezzi e pezzi di ricambio). Mi sto muovendo anche per un mezzo Unimog. Il problema più grande sembra l’omologazione a Camper di un mezzo piuttosto datato. Tu come hai fatto? Bello il vostro sito web aziendale. Se hai qualche impiccio e posso fare qualcosa per voi non esitare a chiamarmi o a scrivermi. Wishing you well on your trip. Assume by now you have left? Fantastic pictures. What a good looking family!Take care, have a very Happy Christmas and Skype us when you can. gia il fatto che non siete diretti in Giappone è un sollievo almeno si sono sopite le indiscriminazioni negativi sulle vostre meta e il loro destino. Vi seguo con speranza per voi e un po di invidia per me. Spero che il viaggio vada bene e che la raccolta differenziata di Giulio sotto il camion si sia interrotta (per il momento). Fatemi sapere tenetemi informato così posso vedere parzialmente il mondo con i vostri occhi sentirne i profumi e percepirne i colori. Non vi faccio nessun altro augurio anzi concluderei chiedendovi di pensare ogni tanto a noi rimasti qua, imprigionati e assuefatti dalla quotidianità indotte dalle nostre abitudini consumistiche. Vi penso con le dita e con il cuore. Ciao Samina, che bello poter tessere questo filo sottile…dove siete,come state? Vi penso spesso ed ogni volta mi si spalanca una finestra dentro ed entra aria frizzante…di qui c’è poco da raccontare…l’inglese è nel cassetto, in compenso sto aprendo sempre più spazio al mio sogno e mi sembra che gli orizzonti pian piano si allargano.Buon viaggio, vi seguirò ogni tanto su questo tappeto volante! A wink from Asia. Same passion, and even the joy of living passion for travel in a quatro ruote Renault. Hope you’re all well and enjoying the trip. After we met on that hot day in Dongola, we carried on north driving through what was an extremely beautiful part of the Nubian desert. We made it to this mysterious place known as “Argueen” a border post that was a big pile of rubbish considering only 3 people are living there. We were, as we suspected, turned back: The Egyptians seemed happy to let us through, saying that the problem are the Sudanese, the Sudanese would seem happy to let us through but said the problem would be the Egyptians, etc… After a couple of hours of trying and trying to negotiate, we gave up and turned around. This was really disappointing considering we were staring at a perfectly straight ribbon of asphalt on the other side of the border that would have lead us 80kms to Abu Simbel. Anyway, turning back, we were mystified to come across a camp full of Egyptians in the middle of the desert about 20kms south of the border. Turns out they are starting to build a road from Dongola to Abu Simbel but even them had to use the ferry from Wadi Halfa to go back home and get supplies. For this they have there own little barge that could fit a couple of cars that crosses the southern edge of lake Nasser. They were kind enough to invite us to put our cars on for free and took us to Wadi Halfa. I don’t think I need to go into any detail about the circus that was Wadi Halfa to Asswan, as I presume you know it! Thanks a lot for the tip you gave us about the route from Al-Qsar to the White desert. It wasn’t easy but we got the two overloaded and underpowered ancient Nissan and Land Rover up that sand dune and then admired the scenery for mile after mile. It was great. Hope you have managed to sort out some of your computing problems and all the very best for the rest of your trip! hi jusalulu, just heard from karleni that you arrived safe in mumbai!! happy to hear that – now just relax and enjoy the scenery there………. as soon as you get some local sim-cards let us know!! thanks for tea and invitation into your home on wheels. Re. Indian 3 days transit..
Our total days spent in India was 4. Crossed Sunauli Monday morning, filled Indian form and got stamp without any further questions. Passed immigrations on Mumbai airport on Thursday just before midnight, got stamps without any questions. Will follow your site. Safe journey in Pakistan. Ciao Luca Sameena Lusira e Giulio ben tornati a casa come promesso il mio indirizzo email – nicoszois@gmail.com – Skype – nikoszo, spero di risentirci e rivederci presto. I really love your journay and videos. In Czech republic we organize film festival Expediční kamera (Expedition Camera) that takes place in several cities on February/MArch 2014. For more information see http://www.expedicnikamera.cz (sorry, in Czech only). The festival is non-profit event and with the proceeds we support various expeditions (like first-ever skiing from the top of Dhaulagiri in Nepal or winter trans-Siberia trips). Are you planning to make movie or short document about your journey. If yes I am interested to show it in your festival. What a phenomenal teaser ! Very well edited. Love it ! Ciao famiglia, ci siamo incontrati a Rimini in occasione dell’home schooling ed è stato bellissimo conoscervi e i bambini si sono divertiti tanto a giocare tutti insieme Alessio è rimasto affascinato dal vostro camion e ora ne sogna uno con la vasca idromassaggio. Spero riusciamo ad incontrarci di nuovo a Tuscania, da voi oppure in giro da qualche parte visto quanto è piccolo il mondo. Un abbraccio da Claudio, Emanuela e Alessio. Ciao Luca, ho avuto l’onore di incontrarti alla nuovatibercar da Giancarlo a ponte san Giovanni. E stupendo quello che fai, tanta fortuna!!! Ho appena finito di vedere tutti gli episodi fuori rotta verso oriente, grande coraggio, bellissimo, il vostro viaggio mi ha veramente emozionato. Un abbraccio. wish you merry christmas and very happy nee year to you and your family. Greetings from Bangkok! I really have enjoyed watching your “Breaking Loose” series. You both have great talent and courage. I hope you do another series soon. Best of luck. Thank you… hope to be making a new doc. in the next year. Only this raining Morning drinking my First coffee I sow on Rai5 your Travel n 2011 (you really arrivederci to Pakistan? Doc stopped before , you’re moving to Siria) Only naming Siria I’m very sad, houw it was wonderful to go everywhere (ok not everywhere without any difficulties but now it’s impossible) and now, all’ this destruction and death. Thanks for sharing your great experience. Ciao. Teresa dreaming a woirld without Borders and walls. Hello Teresa…yes we too very much miss the days when one could travel without plans, when there were times of relative peace.. but not all is as portrayed on t.v. I certainly wouldn’t take my kids to Syria or Libya now, but Egypt, Tunisia, and Algeria yes. These countries live on tourism and we can somehow help by going back. Anyway thank you for your interest and glad you enjoyed…the episode you saw is part of a series and you can follow the rest of our journey in the next weeks….yes we did reach pakistan, but not in the way we planned. ..Buona visione. Ciao…oggi ho visto il documentario del vostro viaggio verso il Pakistan (2011) fino a quando avete dovuto cambiare itinerario poiché the border with Iran were closed then your forced to go trough Siria…il che oggi suona veramente strano poiché sono cambiate tante cose…sono curioso dinseguire la vostra avventura verso il Pakistan..ciao e buon viaggio. Sono contenta che qualcuno si emoziona,i bambini di oggi hanno molto bisogno del nostro tempo, penso che un viaggio con la nonna è un regalo bellissimo! Your children are beautiful. That was a brave journey you took. Thank you, yes it was a hard but satisfying journey, but i often think it is much harder to stay at home in an apartment in a city and bring up your kids with all that this entails…this needs courage!! I srtrictly told my wife and kids at home not to delete the Breaking Loose series I recorded. There is no accurate words for to describe what I saw: You and your family took a hard but a revelatory journey. There is greatness in simplicity. Your children were completely unknowing and innocent to the hardship and danger of the journey. You said you were satisfied by your journey; I believe your children did too. A lesson of truth in hardship and poverty. There is beauty in hardship and poverty; and you all are fully clothed in it. This is true beauty. When I come home from work, I immediate open my set to watch your series with my hand on lunch. Thank you so much. Salve, ho visto su Rai 5 le repliche del vostro viaggio dal Packistan. Sono rimasta affascinata dal racconto e dalle immagini che ho visto (andrò a rivedere le puntate precedenti) e dal modo di vivere il viaggio non come turisti ma con lo spirito della semplicità, della curiosità e della condivisione apetti che mi rispecchiano moltissimo. Anche il modo con cui avete fatto vivere questa esperienza ai vostri bellissimi figli e come abbiano potuto fortunatamente conoscere ed imparare con naturalezza un sacco di cose adattandosi ad ogni evenienza. Mi vien da ridere(piangere) se penso a come siano condizionati da un sacco di pregiudizi e consumismo i miei ragazzi (insegno nelle scuole medie) e a quante opportunità si perdono anche senza affrontare un viaggio come il vostro. Sono molto interessata a ciò che fate e mi piacerebbe sapere dove potervi incontrare per sapere che programmi state seguendo o confrontarmi o semplicemente chiaccherare con voi. Dear Luca and Sameena, I am so impressed and inspired by your family journey in Breaking Loose. Your production, especially your narrated “story” is what resonant in me . Maybe one Day our family of five may embark on such a similar journey that tell of our own story. Salut, nous sommes le Convoi d Anges Heureux. En balade en Toscane j ai penser peut etre faire une visite vers vous si vous etes en Italie. Nous avons un mini bus rouge, venons de Suisse.Sommes à Siena et espérons prendre un ferries lundi pour la Croatie. Nous vous avons renvontrer au rassemblement en mai . Ho rivisto le prime due puntate di “fuori rotta – verso oriente” (le avevo registrare da Rai 5 lo scorso anno) : veramente belle, siete persone positive, da voi una buona energia. Vorrei rivedere le due puntate mentre siete in India. Siccome non dispongo di un computer con la ADSL, vi chiedo se è possibile scaricarle e da quale sito.